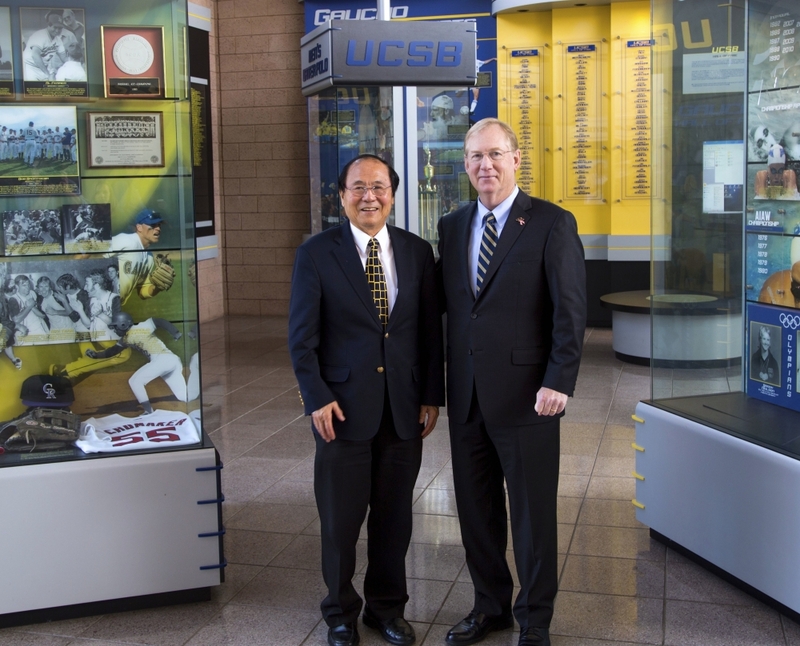 Chancellor Henry T. Yang welcomes John McCutcheon to UCSB. McCutcheon is the new Director of Intecollegiate Athletics. 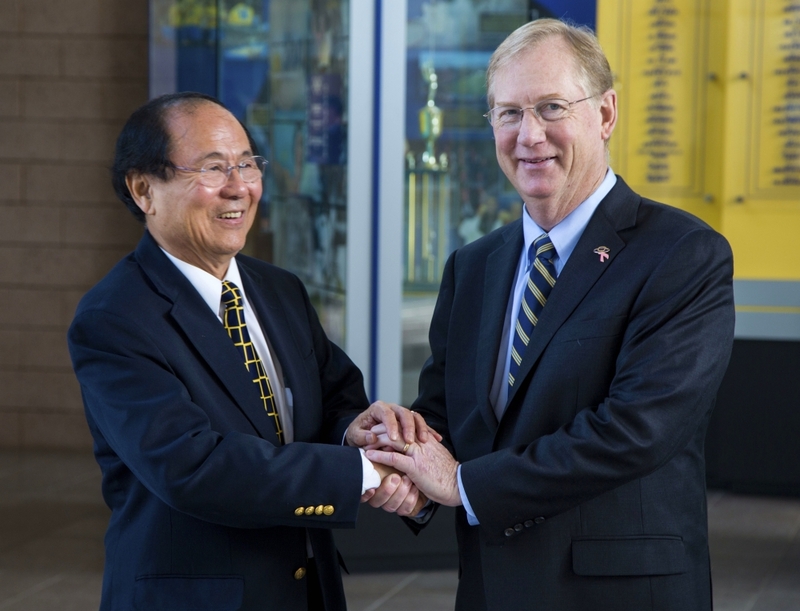 Chancellor Henry T. Yang, left, and new Athletics Director John McCutcheon pose in the lobby of UCSB's Intercollegiate Athletics building. John McCutcheon has been hired as Director of Intercollegiate Athletics at UC Santa Barbara, Chancellor Henry T. Yang has announced. McCutcheon has held the same position at the University of Massachusetts for the past 11 years. He will begin his tenure at UCSB on March 2, 2015. While at UMass, McCutcheon oversaw an era of growth on and off the field that was unprecedented at the school. During his tenure, the program enjoyed some of its highest levels of annual donations and corporate sponsorships. Nearly every athletic program received major facility upgrades to promote a future of success. Perhaps the most historic move in the history of UMass athletics came during McCutcheon’s era with the transition of the football program from the Football Championship Subdivision (formerly I-AA) to the Football Bowl Subdivision (I-A). While those accomplishments ensured success on the playing fields, UMass student-athletes enjoyed impressive academic success during McCutcheon’s time in Amherst as well. A total of 334 earned academic all-conference honors, including 15 league student-athletes of the year. Nationally, UMass has produced 11 Academic All-Americans. Much of this success was due in part to an increased focus on the UMass academic support staff through the addition of learning specialists, an enhanced tutoring program and initiatives such as the CHAMPS Cup, which promotes the best possible collegiate experience for student-athletes. McCutcheon was officially hired as the UMass Director of Athletics on Feb. 4, 2004, after serving in the same capacity at Cal Poly for the previous 12 years. All told, under McCutcheon’s watch, UMass won 38 conference titles and reached 29 NCAA tournaments. Several teams enjoyed milestone moments over the past decade, such as the 2006 football and men’s lacrosse team’s reaching the NCAA Championship; the 2007 men’s soccer team’s run to the NCAA Final Four; the men’s ice hockey team reaching the 2007 NCAA Tournament for the first time in program history; and the men’s basketball team returning to the 2014 NCAA Tournament for the first time in 16 years. As for facility enhancements and new facilities, perhaps no UMass athletic director has accomplished more in their term of service. In just the past year, three new facilities were opened: the UMass Football Performance Center, the Martin And Richard Jacobson Press & Skybox Complex at McGuirk Stadium, and the UMass Rowing Boathouse all coming online. The $28.5 million Champions Center is slated to be completed this spring for the men’s and women’s basketball teams. These latest facilities come on the footsteps of the Campus Recreation Center, which was opened in 2009 and was named the 2012 Facility of Merit Award Winner by Athletics Business Magazine. McCutcheon’s tenure at Cal Poly was also marked by progress and transition. He helped the school reclassify from Division II to Division I-AA and secured membership in the Big West Conference. Cal Poly teams won 15 conference championships with 11 teams and 45 individuals advancing to NCAA postseason competition. McCutcheon also helped develop an athletic facility master plan at Cal Poly that enhanced all facets of the department and provided much needed competition and practice space for student-athletes. That project included a $20 million capital campaign that collected funds from private, corporate, state and student sources. Additionally, Cal Poly doubled its staff during his time at the school. A member of the National Association of College Directors of Athletics since 1992, McCutcheon was also a member of the Collegiate Athletic Business Managers Association from 1978-1992. He has served on the NCAA Management Council, the NCAA Leadership Council and the Big West Conference Executive Committee. Before his initial move to the Central Coast in 1992, McCutcheon spent 12 years at Boston College. He served as associate athletic director for business and operations from June 1991 to August 1992; assistant athletic director from July 1988 to June 1991; and athletic business manager from July 1980 to July 1988. He was also assistant athletic manager at the University of Maine from July 1977 to July 1980. McCutcheon, a native of Pittsburgh, Pennsylvania, earned his bachelor of science degree in health, physical education and recreation from Indiana University of Pennsylvania in 1975. He also earned a master’s degree in education from Ohio University in 1978. McCutcheon replaces Gary Cunningham who has acted as Interim Director of Intercollegiate Athletics since July of 2014. Prior to Cunningham, Mark Massari led UCSB Athletics for six years.